An accomplished chocolatier who won the BBC Two show Bake Off Crème de la Crème has visited Bath College to teach students a range of chocolate-making techniques. Mark Tilling, an award-winning confectioner who came 7th in the 2009 World Chocolate Masters Finals in Paris, showed students how to melt and temper chocolate, how to create a marbled effect, stamp medallions and make different shapes during a three-hour workshop. His visit was part of an employability week at the college, which has so far included workshops for catering students on bread making, cocktail mixing, wine tasting, cooking demonstrations and mock interviews with employers. 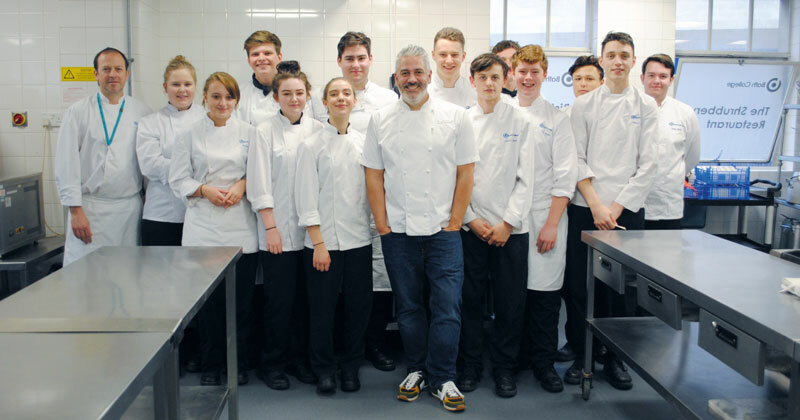 “We’re always looking to engage with industry and are so thankful for the experts that continue to support our students,” added Ryan Hanson, the college’s deputy head of hospitality and catering.